Water hyacinth is a floating plant that originated in South America and that now can be found around the world in tropical and sub-tropical regions. In the United States, this plant can be found in the south and the southwest. 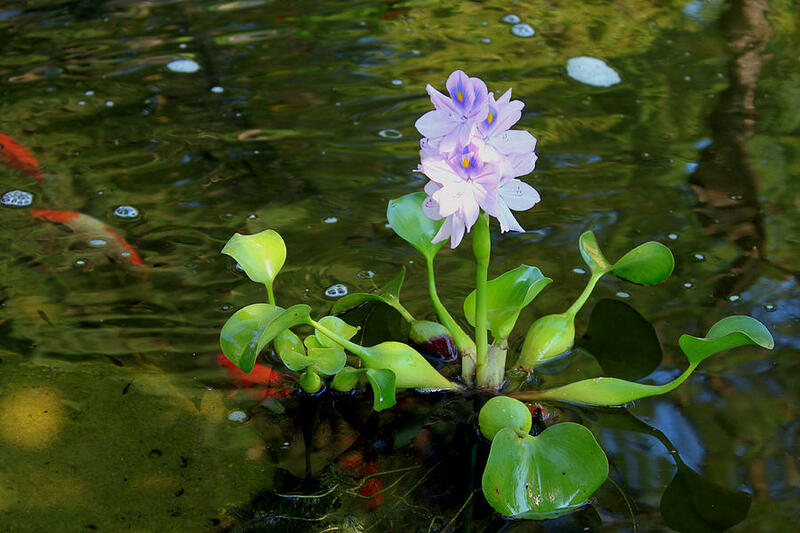 In the wild, water hyacinth can grow as high as 3 feet but in smaller ponds their growth is limited to a few inches. The leaves are round and dark green attached to an inflated petiole that helps the plant float on the surface of the water. It’s roots are dark, dense in volume and can grow up to a foot. During its flowering period, the water hyacinth will have violet flowers that will appear for a few days. Water hyacinth multiply easily and can easily cover large areas of a pond if it goes unchecked. This plant is considered to be an invasive species and should never be released in the wild as it can form thick mats and block waterways. Submerged portions of this plant provide a hiding place for small fish and invertebrates. In addition, they provide shade for fish in ponds and is a favorite among pond keepers. The Water Hyacinth is a tropical plant and does incredibly well during warm seasons. However, due to this plant’s popularity among pond keepers, many end up in regions with cold weather and they will end up dying if they are left in the pond exposed to the cold. The best way to winterize Water Hyacinth and enjoy them during the winter is to place them in an aquarium and provide them with light in the natural spectrum (5000-7000K). Make sure to provide enough overhead space as the Water Hyacinth can sometimes grow taller. In addition, one can add a water heater to keep the water temperature in the 75-80 F range and aerate the water with a basic air pump. These conditions will not only help the Water Hyacinth survive but thrive during winter as they will continue to propagate just like in summer time.